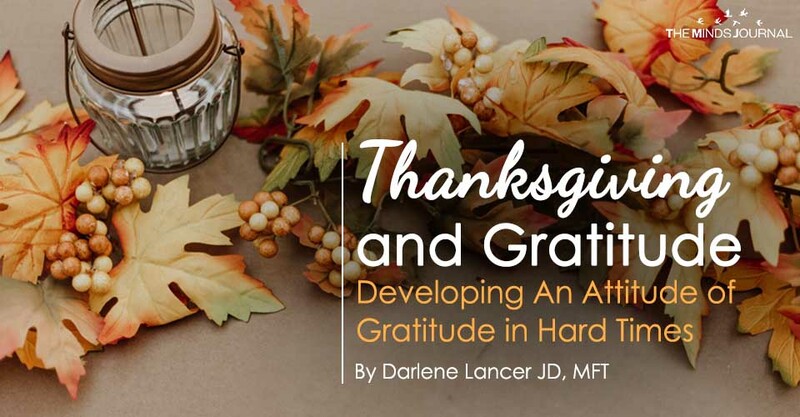 Many of us struggling with health, financial, or emotional problems find it challenging to feel grateful around Thanksgiving. Some people always have a habit of looking at the negative. One reason for this is that our brains our predisposed to solve problems, and we take what makes us comfortable for granted. All world religions stress the importance of gratitude. In Judaism, prayers of gratefulness are an essential component of worship, which orthodox Jews recite one hundred times a day. Gratitude was referred to by Martin Luther as a “basic Christian attitude.” The Quran states that the grateful will given more. Moslem believers are encouraged to give thanks five times a day. Sufi, Hindu, and Buddhist traditions also emphasize giving thanks. Moreover, religion exhorts that we should be grateful notwithstanding our current problems and circumstances – not to deny them, but in addition and in spite of them. To feel gratitude only when we feel good is considered narrow-minded. In the Bible, Paul teaches, “In everything give thanks.” The Hebrew Midrash instructs, “In pleasure or pain, give thanks!” Islamic tradition says that those who give thanks in every circumstance will be the first to enter paradise. The purpose of prayer is to open us to the presence of God. When it’s heartfelt, it changes us. Prayers of gratitude affirm God’s presence in everything and potentiate infinite possibilities. The mystic Meister Eckhart believed that thanking God was the most important prayer. Prophets and monks know that gratitude brings us closer to God. Even if we’re not religious, gratitude enables us to see our life in a larger context beyond our immediate troubles. It expands our experience of life and counteracts an ego-centered contraction and preoccupation with losses, fears, and wants. Being grateful only when good things happen reinforces our ego’s demand that good things happen, setting up greater disappointment when things don’t turn out as we desire. This, according to Buddha, is the cause of suffering. The sages also knew that gratitude actually shifts our perspective from feeling depressed, envious, angry, or self-pity to a happier mood. It can open our hearts to joy and generosity because we begin to feel that we’re blessed. Moreover, how we view our circumstances determines our ability to manage and overcome them. Often it’s worry or anxiety about the future or shame or guilt about ourselves that colors how we see a situation. Negative beliefs and emotions limit our imagination and ability to cope and solve problems. Hence, our state of mind ultimately is more important than our outer experience. Cultivating an attitude of acceptance enables us to feel grateful even when we’re in pain. It’s helpful to view all experience is an opportunity to grow and learn. Wrote Helen Keller, “Everything has its wonders, even darkness, and silence, and I learn whatever state I may be in, therein to be content.” Rather than seeing ourselves as a victim of circumstance, acceptance of reality and developing gratitude for what we do have verses focusing on what we don’t empowers us to take appropriate action. 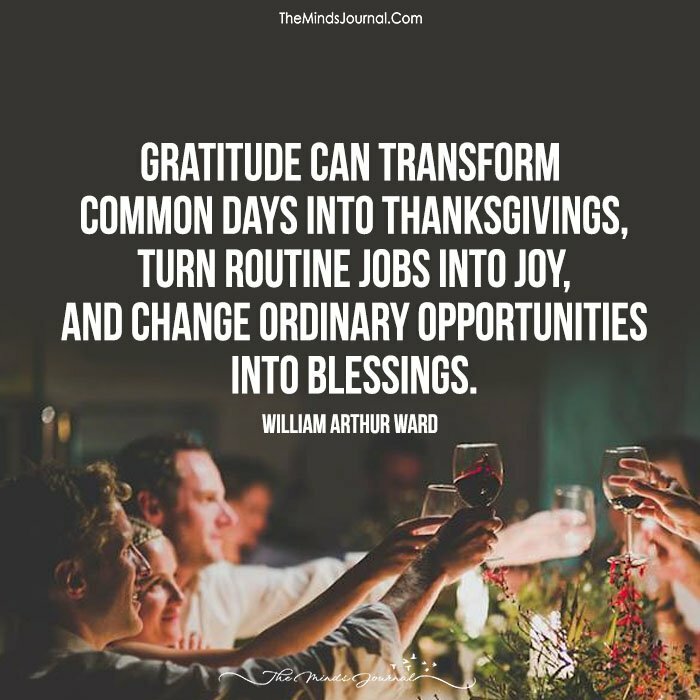 With the advent of the positive psychology movement, gratitude was only recently subjected to empirical research. What religion has known for millennia, science has confirmed. Numerous studies suggest that grateful people are more likely to have higher levels of happiness and sense of well-being and lower levels of stress and depression. This naturally translates into better physical health.